A really simple but versatile idea for a plenary activity. 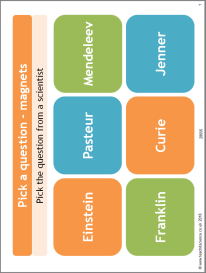 Students choose a scientist to reveal a question. Use Teachit Timer to add an element of competition! Use our Teachit Timer to add an extra element of competition!